TORONTO, ONTARIO, CANADA, June 4, 2018 / — Canadian rock band, Across The Board, takes a pause during their SONIC BOOM album release project to support Ovarian Cancer Canada with a brand new song “She’s Listening” and a 5 song EP with never-before published acoustic versions of some of their songs including JANE ON FIRE, SAD GUITAR, ONE WAY TICKET and BARB’s SONG. “She’s Listening” took its title from the project by the same name that brings female indie artists from across the country together for a collection of acoustic performances to promote ovarian cancer screening and education and to raise funds for Ovarian Cancer Canada. ABOUT ACROSS THE BOARD: Jacqueline Auguste and her life partner Andy Ramjattan (bass player for the band), founded the group in 2013 out of a desire to move their garage and back yard jams to social media. They created a popular cover webseries, “Pick Up & Play” now in its 5th season on Youtube, and decided to take their show on the road with the debut album “JANE ON FIRE”, released in June of 2016. Since then, Across The Board has played to sold-out crowds across Ontario, and from Newfoundland to Vancouver. 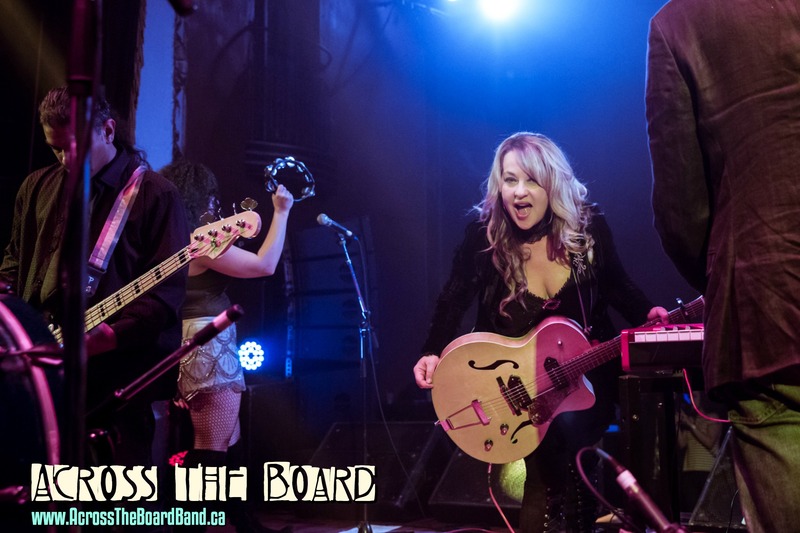 Recipients of four international music awards for work on “JANE ON FIRE” and “AMENDS”, ATB is set to take off yet again on tour this spring and summer across Southern Ontario and into Quebec and the Maritimes with “SONIC BOOM”. ATB is a 2018 Josie Music Awards nominee.